Our passion is driven by ensuring you will have an unforgettable experience and the one you have always dreamed of. With over 30 years of experience our trained consultants are here to help you find that perfect dress for your special day. 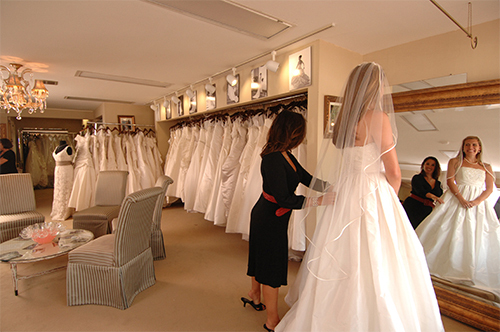 As part of the 30 year history of ABC Wedding Services, ABC Bridal continues the tradition of bridal leadership through selection and service – a ‘must see’ experience for brides throughout Alberta.With styles from over 20 designers, ABC Bridal has the best selection of gowns and ladies’ fashions for your entire wedding party. And to complete your bridal image, we have the latest accessories. Our tiaras, veils, and jewellery will make everything work on your most important day. Located in central Edmonton, close to NAIT, Kingsway Garden Mall, Yellowhead Trail and 97th Street, (Highway 2 North) ABC Bridal is a convenient meeting place for your bridal shopping experience. Our 3000 sq. ft. fashion centre is part of an even larger complex with several wedding businesses. The most notable among them is ABC Weddings. They offer wedding sales and rental of all your wedding decorations and supplies. As well they provide special event products for your garden wedding or large formal reception. Ask about discounts on ABC Weddings if you purchase your garments from ABC Bridal. Free street parking is available anytime along with plenty of free metered parking during evenings and on weekends across the street. "Love the staff they are friendly and knowledgeable. Beautiful dresses at a decent price." "A pleasure as always been dealing there since are wedding in 1983." "Great service and best dresses in the city"
"Wonderful selection, great service, welcoming staff"
"Amazing experience, great staff, a wide selection"
"Pretty dresses for Grad and at a good price"
"Affordable prices, knowledgeable consultants..had a great experience"